That same code working well in simulator ios8 device iPhone5. 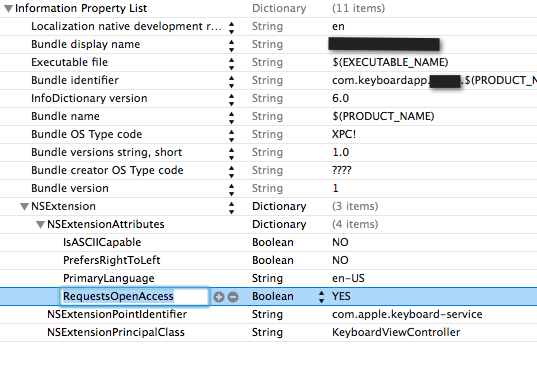 please is there any more code needed for this i read in apple doc that said NSUserDefaults initWithSuiteName help me in this thank you. now that working fine in my device and simulator. hope that helps to others. In iOS8, a custom keyboard and the containing app can communicate using a shared container. This is achieved by asking the user to allow full access, which is a setting in the iOS settings app under General->Keyboard->your keyboard->Full Access (ON/OFF). Not the answer you're looking for? Browse other questions tagged ios ios8 custom-keyboard ios-keyboard-extension or ask your own question. How to load a view when its outlets and actions are contained in the view being loaded?